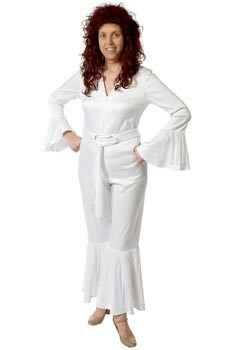 Description: White jumpsuit with long red curly wig and white gogo boots.Other options also available for male and female Abba, including flared pants, tunic and sparkly tops and a selection of wigs. Price includes wig. Size: Costume pictured 10/12. Other styles and sizes available.